Taken as a group, the fires are already among the 10 deadliest in California history, and the death toll is expected to grow. 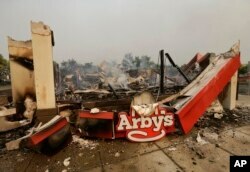 Smoke rises from an Arby's Restaurant that was destroyed by a wildfire in Santa Rosa, Calif., Monday, Oct. 9, 2017. "All that good stuff, I'm never going to see it again,'' said Jeff Okrepkie, who fled his neighborhood in Santa Rosa knowing it was probably the last time he would see his home of the past five years standing. 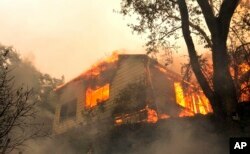 Flames from a massive wildfire consume a home on the Silverado Trail, east of Napa, Calif., Oct. 9, 2017. Winds have posed a challenge to firefighters in the state this year despite a relatively wet winter that followed years of drought. The fires that broke out Sunday burned ``at explosive rates'' because of 50 mph winds, said Ken Pimlott, director of the California Department of Forestry and Fire Protection. "We just had to run and run. It was full of smoke. We could barely breathe,'' Hoe said.